In this article I would like to introduce you to my best knife set reviews. I selected only top rated knife sets, which I used and tested myself. I’m a butcher for over 20 years so I had a chance to test hundreds or even thousands of knives so I will only show you the ones I think are worth consideration. 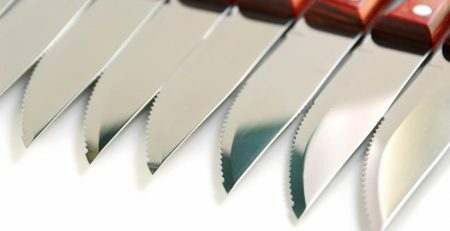 Each task requires different types of butcher knife and because there are many types of knives, it will be easier to buy a good knife set instead of a single one. There are various advantages to owning one. You can buy it easily on the market, especially online. They are both affordable and have various uses either for professional or domestic purposes. You can take advantage of their functionality and decorative quality for the kitchen, but not only. Restaurants also needs butcher knives sets. Chefs may need different distinct knives for their jobs including the shape and size. This is one of most popular knives. It can be semi-stiff or flexible depending on the uses. The blade size can be 3 inches to 8 inches in length. The primary use of this knife is to separate bones from the meat. This type of knife owns a special function. The knife has a curved and wider than other knives blade. It is made to skin many types of animals. This knife has usually wide and long blade. You can use a cleaver to cut and chop through big bone or meat. Some people also use this knife to open lobsters. It’s useful due to its power. A scimitar knife is related to classic butcher knife. It has upward blade with a curved design so you can use it to trim steaks perfectly. It’s used mostly by professional butchers or chefs. It’s one of the most helpful tool used by butchers. The design is quite thin with fastened narrow blade and it has a good rigidity. It’s a very handy item for butchers and helps with cutting bones and harder parts of the carcass. A fillet knife is a kitchen tool simply used for filleting. These knives are very flexible and are used for removing the bones of meat, fish and poultry. Even the best and most expensive knives needs sharpening. It is essential tool to keep your blades sharp and in a good condition. If you would like to get more information about the types of butcher knives check my other article about how to find the right knife for your needs. What knives are in the set? One of the main aspects is what’s in the set. Below, I listed the most popular items that every butcher/chef must have. There are other types of knives as well, and I will talk about that later. A size of the knife is an important aspect. Different size of will provide a different result of cutting. A smaller knife offers a versatile function while the bigger ones give a better cutting power. Small knives are good for slicing, cutting, and trimming meats. Butchers will choose larger knives as they are stronger and sturdier. Knives with big blades can cut through meats easily. Perhaps you might think that a butcher knife is only useful for cutting meats, but it also can cut through potatoes, onions, vegetables or watermelons. A good butcher knife should have a sharp blade with a flexible feature. It also needs to have a comfortable grip. Big knives are harder to control, but they are stronger. On the other hand, you can make a precise cut with a small butcher knife but you should use more force when cutting tough meats. In the terms of handle, there are 3 choices including wooden handles, stainless steel handles, and plastic handles. The first one is quite common. Yet, there are safety concerns about wooden handles so you need to be more cautious about this product. Knives with a wooden handle are comfortable to use and they are quite attractive. Stainless steel handles are the good choice as they are maintenance-free. You can choose this one as it’s durable and easy to maintain. Knives with a stainless steel handle have good balance. However, they don’t provide a good grip so they can be slippery sometimes. Plastic handles became popular among households and professionals. All butcher knives with a plastic handle provide a good grip and they are easy to clean. In the terms of blades and design, you can choose 4 main options including straight edge, Granton edge, serrated edge, and hollow ground edge. The first choice is the most common. The other name of straight edge blade is flat ground. The use of this blade is quite wide. The Granton edge blades may create a space when slicing meats. It’s preferred for cutting ham and poultry. The serrated edge knives are also called scalloped edge blades. They have teeth all over the edge, which provide a good penetration through the skin or outer part of meats. This one is a perfect choice for cutting either fruit or bread. Another option is hollow ground blades. They have a fine edge, but they are more vulnerable. It’s because of their thin edge feature. Hollow ground knives can be dull over time relatively quickly, so they aren’t good for heavy-duty cuttings. On the other hand, they are good for peeling fruits and some skinning. I listed below some of the materials used to make the blades. VG-10: It’s preferable among butchers as it has good edge retention. This type of stainless steel is popular in making butcher knives. It’s often used in commercial pantry knives worldwide. This type of material offers high durability. 420HC and 440C: The other name of this stainless steel material is German steel. Both of them are durable and sharp. They also provide a great resistance against corrosion and stains. They are perfect for professional chefs. Almost all professional butcher knives have their own uniqueness. You can’t find a specific butcher knife with the same quality. In the terms of price, you can either buy the most expensive one or the cheapest one depending on your necessities. There are many brands that you can buy at different prices. Don’t forget to check an online store such as Amazon to get some interesting discounts and offers. Victorinox Swiss Army set will give you a great help for butchering, fishing and hunting. The knives are made in Switzerland with high-quality material. They are very useful while doing the field dressing. Also, many people have already recognized Swiss Army as a manufacturer of the finest blades since 1884. This butcher kit combine both multifunctional benefits with high-quality cutlery. They offer superior quality either for butchering, hunting or fishing. They are more than just a brand. Perhaps they represent anything that you ever need. You can get the quality in an affordable price. Victorinox Swiss Army Field Dressing Kit is used mostly by butchers and hunters. It is a perfect set for those who love to hunt or butcher animals outdoor. Most hunters say that this set is one of the best product available on the market, especially for outdoor use, but not only. It will be also useful for those who love to cook or butchers. Everything that comes with the product has high-quality and multifunctional benefits. All the knives will successfully fulfill any expectations. How to clean these knives? Victorinox Swiss Army indeed will fulfill anything you want. With a proper care, you can even use the knife set for years. These knives don’t need a special treatment, especially in the terms of cleaning. You can clean them with mere soapy water in the sink. If necessary, you should apply oil to preserve the blade from corrosion. Vinegar also has the same function to preserve the knife. You’ll get lifetime warranty with this product. The knives can withstand band temperatures. The lifetime of these knives can be years or even more depending on the usage and care. Overall, you need only to take care of the knives and use them properly to avoid damages and corrosion. Due to the efficacy, the knives will be the best choice among others. Each of them gives a specific functionality for cutting. You can save much time by using the most appropriate knife depending on the purposes. Both the material and handle are good. This kit can be used either outside or inside. The blades are sharp and durable. Moreover, they are easy to sharpen. In the terms of price vs quality, price isn’t expensive. You’ll get all the knives in a great shape and the price is really affordable. If you are serious and passionate about your job, I can only say to get this set and you’ll see what I meant. I bought this set almost 2 years ago. All knives in this set are of the quality that I expected buying any Victorinox knife. In the last 6 months I processed with this set 4 deer and even more beef and pork. However, I didn’t need to spend much time on the edges and its durability is definitely one of the biggest advantage. I didn’t use much of the fillet knife, but all the other knives are vey, very solid. I’m a huge fan of Victorinox knives and many butchers I know who also bought this set were happy so if you don’t want to waste more time looking for more sets you should consider getting this one as that will be a very smart choice. I think, all butchers, chefs and not only have heard about Ontario Hickory brand. These classic knives are made of high-quality carbon steel. All of the knives are attractive and they have sturdy handles. This knife set is preferred for those who look for sharp and long-lasting knives as all the knives can last for long if they are washed and handled properly. In a nutshell, Ontario Hickory is great for different purposes including classic cutlery. Most knife lovers have this set in their collection. They consider it as one of their favorite and classic tools. These knives can offer great quality. Ontario Knife Co. 5-Piece Old Hickory is very useful for those who want to process meat. Due to their sturdiness it’s quite popular among butchers. You can take overall benefits by buying this kit. When it comes to clean Ontario Hickory products, there are many methods you can choose. First, you can use the vinegar solution for the blade surfaces. With a proper care, you are able to use those knives for years. Another method to clean it is to use soapy waters. Clean all the greasy materials in the sink. It may take minutes, but you will be able to preserve the blades very well. Remember, you shouldn’t use strong components when cleaning the knives. These knives also shouldn’t be washed in a dishwasher or stay in the water for too long because of the wooden handles. After cleaning you should dry the wooden handle immediately to prevent it from cracking. Yet, you need to know how to take care for these knives to avoid corrosion and other troubles. It comes with limited lifetime warranty, but if you take care about the knives properly you will never have to worry about that. I know people having Ontario products for 15-20 years and the products are still in a good shape. Most buyers are attracted not only by the sharpness of the blades, but also by the handles. The handles are quite long with straight and buffed look. The tang of the blade is fully visible. It is both strong and functional. The handles provide a comfortable grip for the users. After months of usage, their sharpness is still good. Overall, this set is good for anyone, either households or professionals. With so low price you will get total satisfaction of this product. The blades are quite good as they can reduce the brushing when slicing meats. On the back of the knife blade, you’ll find a nice spine. You won’t waste your money at all when buying this item. For any butchers who want to use simple, but professional butcher knife set, they can choose Jero 3 Pieces Pro Butcher Meat Set that can be used for skinning, boning, and butchering. The knives have been specifically designed with high-quality material. They are very sharp and you will get a perfect cuts by using it. It’s commonly used by many people in the US. It is known that these knives can be used for anyone who works as a butcher, hunter, fisherman, and anyone who considers that knives are very important to support their job. You will be able to properly do most of the main butcher tasks with this set. These knives are quite simple and not too big so you can easily clean them up using damp cloth and water. The material is made from the best stainless steel so it cannot easily get rusty despite you clean it up using water. If you are afraid of corrosion, then you can use a little bit of oil to preserve the blades. This butcher kit can be purchased at many stores and it comes with a lifetime warranty. Since it’s made of the best material, then you are no need to be afraid of any part of the knife and it can be used for years. Butchers have very good opinions about the use of Jero knives. This meat processing set is the simplest butcher set that is commonly used in the US. Besides, these knives are also very sharp so they can cut a piece of meat in just one cut. The handle is also comfortable which makes the users feel no pain even though they use it for a long period of time. It is undeniable that it’s very affordable and has very high quality material. These simple, but solid knives offers convenience. If it is compared with another set, then it can be said that this one is the cheap, but it still belongs to high-quality product. I have been using this set long enough to know that it’s worth the price. This kit is very sharp and has three different functions so you can use them according to your needs. This is your best option if you are looking for simple, affordable and high quality knives. For those who like to do their activity outdoor, but they need a portable butchering kit, this is another great set of knives I would like to present. This is one of a complete, high quality portable butchering set to prepare waterfowl, small game, fish, wild turkey and big animals. There are four practical knives included that are suitable for butchering and each knife has a superior design with a razor edge and taper ground made from stainless steel. Outdoor Edge Game Processor PR-1 12-Piece Portable Butcher Kit is a professional butcher knife set those who like doing some outdoor activities such as hunters and butchers. It is undeniable that most of the hunters considered that it’s the most complete butcher kit ever that is available on the market. It can also be used for indoor usage. This option offers high-quality knife products and multifunctional advantages. Buying this product means that you will get several high quality knives that you can use for almost everything. It is really easy to clean up this knife. You can use anything to clean up this tool after the usage. Since they are made of stainless steel, the material quality will be always maintained. However, you still need to use soapy water and cloth. If you are afraid of corrosion, then you can use some oil. Buying this butcher kit you will get a lifetime or 1 year warranty depending where you buy it. This product is made of a high quality material so it will not be damaged easily. As it is mentioned, this butcher kit consists several knives that can be used according to the needs. Therefore, many people said that this product is a complete butcher knife set that is really useful for many jobs. Talking about this butcher kit, you must wonder, how much it costs. Do not worry because this butcher kit is not too expensive and it has the best quality. Some professional chefs even use this butcher kit when they are dealing with meat cutting because it is known to have very sharp blades. If you are really looking for the best butcher kit on the market, then Outdoor Edge Game Processor PR-1 12-Piece Portable Butcher Kit is the best option for you. I have this set relatively not long – around 1 year – and it gives me all I want and need. This product is popular among hunters and butchers. It’s perfect for those who love outdoor activity including fishing, camping, hunting, and more. The overall quality is very good, especially that the price is almost half if you would like to get any other similar set. All items inside the set are stored in a storage case. It’s to make sure that they are managed well, especially during the field dressing. With such package, you are able to transport the knives much safer and have them properly organized. • Caper knife (8-inch overall). Elk Ridge knife set is most popular among hunters. You can use it to cut either small or big animals. Some people use it to cut fishes and poultry. The others carry it for their camping or outdoor activities. There are many types of knives you can get from this set including boning knife, saw-knife, caper knife, butcher knife, and also a gut-hook knife. It isn’t hard to clean this one. You can use either sink or dishwasher to completely wash the knives. However, I will never recommend to clean any knives in the dishwasher as it may dull the blades and damage some other parts of the knife. The safest way is to use a damp cloth with a bit of soap. You can also use a knife sharpener to maintain the sharpness of the blade. To prevent rust or corrosion, you can apply vinegar or oil on the blades. In the terms of durability, it can last for as long as you take care of the knives. It comes with a limited warranty. People are quite attracted to buy this butcher set due to its multifunctional uses. 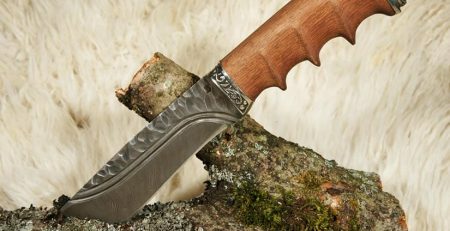 Elk Ridge knife gives more than you have expected. The handles don’t show any bad qualities at all. Users can grip the knives well without hassles. Elk Ridge knives comes with an affordable price and I can say that it’s the best knife set for the money. You shouldn’t worry about its quality as many people have been satisfied with this kit. It is useful either to cut meats or other foods. Aside from its outdoor functionality, you can also use it for indoor purposes. In the end, almost all users are satisfied with the quality of this product. I had a few similar sets in my career and all of them were at least twice more expensive. This one was recommended to me by my friend who is a butcher and a hunter. He told me that when he bought it, he didn’t expect much from this set for such a low price. However, after a few months of using the Elk Ridge’s knives he was totally surprised. I got this one as an outdoor set and it does the job pretty well. I have to admit that I had a little higher quality knives in my hands, but they were much more expensive and many times just one knife was 3 times dearer than the entire set! For that price you get a really good value. I processed some big animals without any problem. In other words, I wouldn’t recommend it to you if I wasn’t sure that you will not regret it. 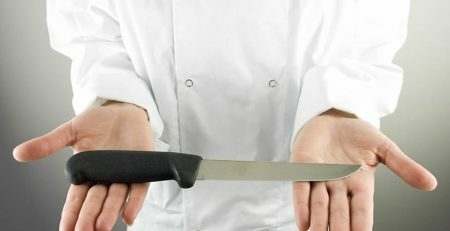 I prepared for you this comparison table to help you to find and compare your best butcher knife set I reviewed in this article. You can compare the products using different factors such as price, rating etc. It is a quicker way to find what is the best affordable knife set for your needs. By clicking on any of the link you will be taken to the actual review of the product and from there you can click the button to buy the high end knife sets. Would you say it is better to choose to buy a set of butcher knives over, say, a set which you have put together piecemeal style? Through my own experience I have always been against buying a pre-made set of knives. I’ve found that not every brand is equal in terms of knife styles, and quality knife sets are typically a lot more money, and provide extra knives which end up forgotten in the knife drawer (and cheap sets are typically poor quality). Now, I am speaking from the other side of the spectrum – a kitchen chef – so it may be different from the perspective of a butcher. I would genuinely like to hear your thoughts about manufacturer pre-made knife sets vs custom piecemeal built knife sets, and if you feel this applies to all knife sets or if butcher sets and chef sets are in their own categories. Thank you for your comment and a great question! For experienced chefs or butchers, I would suggest to pick the knives individually. For example, I have my favorite knife from every brand and I would pick the best ones from different brands and get a proper set like that. However, not everyone is experienced and know what knives are good or bad and for them, and it is safer to buy a set – especially recommended set. One of my good friends worked once in Victorinox factory in Ibach, Switzerland where the knives gets made and he told me that they use exactly the same knives for sets as for individual sales. I’m not too sure if every manufacturer doing the same thing, but at least we know that there is no difference in the quality if you buying a set or individual knife. You are right that sometimes knives ending up in a drawer, never used, but there is so many types of sets that you can easily get one with just the knives you need. For example, I reviewed in this post the Jero set which including only 3 knives. Summarizing, if you are experienced butcher or chef, that means that you know already much about knives and you know, which brand and knife is better and which is worse and in this case I’d suggest to build your custom piecemeal knife set. For people without that experience, I would suggest to get a knife set of a good brand. Read reviews, decide what knives are needed and search within their budget. I’ve been looking into getting a set of knives for a while now. Admittedly, I gravitate towards sets that have really nice handles and metalwork (like Damascus blades). Do you plan on reviewing any of those kinds of knives in the future? I’d be curious to see what you thought about some of the sets I’ve looked at. Damascus is a really top and exclusive brand. I have much to say about these knives and I will definitely review them in the future. If you have any particular set or knife you would like me to review, please let me know and I’ll do my best to help. My husband loves to cook and he always likes working with good knives. His knives are a bit old and I think it would be a great gift to offer. After a while, can these knives be sharp? Because my husband likes the very sharp knives. The knives comes very sharp and they will stay sharp usually for long, depending, how much your husband will use them. 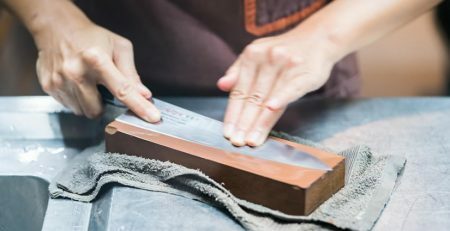 However, after while – like every other knives – they will require some sharpening, but with proper knife care and good sharpening they can be sharp as new for long years. Wow what a great reveiw, I have always valued good quality knives, and hate when I have touse poor grade blunt tools. It is definitely important and safer to use the right knife for the right job. Hopefully I won’t be due for a new set of knifes anytime soon but I will be definately leaning toward the victorinox set. I do like the knife sets in your article today, they are very nice in appearance and look to be very good quality knife sets. How would I choose between these knife sets, they all appear to be impressive knife sets to own and use in my own kitchen? 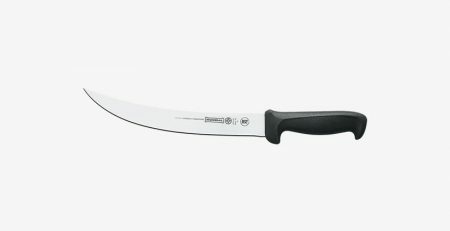 I am confused with several of these knife sets to choose from, what would you recommend for someone in need a good knife set for general cooking but i do not butcher my own meat. In regards to your question, for general cooking and use I would recommend the Ontario Knife Co. 5-Piece Old Hickory Knife Set. You’ll get Slicing Knife, 2 Paring Knives, Butcherâ€™s Knife and Boning Knife so all you really need in your kitchen. With a proper maintenance they will last for long years. I have this set for a few years and using the knives every day and they are still in a very good condition. Hello there, your website looks great! On reading your knives, I think it would be very helpful to include some photos of each knife. I also enjoyed reading your reviews. But I also think it would be proved useful to add some more photos or perhaps even videos. Also, I would like to know the prices for the knife sets on your website rather than having to go to Amazon. All in all, this information is very useful! Great post! Unfortunately, but one of the affiliate rules with Amazon is that the price cannot be added as the prices change quite often.. However, I will certainly consider adding more photos and videos. Hi, thanks for your review. when it comes to kitchen knife i consider all as one until i came across your review. Sometimes i use normal knife to even cut my fish and meat. Now i know the advantages and types of knife use in kitchen. In your review you mention a lot of butcher knives. can you recommend one for me? And why i should buy it. hope to hear from you. It really depends what exactly you need to do as every knife has a different use.